Easiest navigation function is with Bookmarks or Document Outline option. The updated ephemeris is now a text formatted table instead of the image that we used in the past. Today's date is highlighted in a light yellow on the table. The retrograde transits appear in red. The planetary positions are noted for midnight (00:00), Standard GMT (aka UT). S.T. is sidereal time. Additional information is included at the bottom of this page. 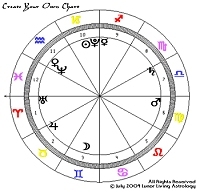 Click this Link to Test your skills Online - can you create today's Astrology chart? This link opens in a new window. 1) Keep it simple to start off with. 2) Enlarge your browser screen (press the F11 key for most browers - press it again to return the screen to normal) This gives you more room to work on the page. 3) Place the Aries glyph in the first outer-wheel (house #1), Taurus glyph in the second outer-wheel (house #2), and continue using the twelve zodiac glyph signs all the way around. 4) Now place the Sun glyph in the inner portion of the chart relative to the zodiac sign that the Sun is in today. Continue placing the other planetary glyphs on the chart based on the signs they are in. 5) See the instructions on the page for an example. 9000 years Ephemerides in PDF AstroDienst - Swiss Ephemeris are viewable online. An ephemeris (plural: ephemerides) (from the Greek word ephemeros= daily) is a table providing the positions (given in longitude) of the Sun, the Moon, and the planets in the sky along the zodiacal ecliptic at a given moment in time; the positions are usually given for either noon or midnight depending on the particular ephemeris that is used. FAQ: What time zone and time is the ephemeris table cast for? The ephemerides that I use for this site are 0:00 UT (aka GMT) and the time is midnight.